Health Scholars™ is a new way for nurses and preceptors to learn and train. It's interactive, self-contained education built on a mobile platform. Health Scholars is interactive education for nurses and preceptors. See a demo and find out how to get access to the course vault. 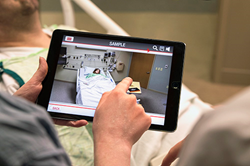 To provide nurses with immersive, collaborative education, CSE Software™ Inc. and SIMnext™ have developed Health Scholars™ courses on a mobile platform. Available in iOS and Android operating systems for a number of devices, the Health Scholars app is the first standardized, interactive nurse education of its kind. The self-paced learning accommodates the full spectrum of nurses and other healthcare professionals from novice to expert. The immersive, collaborative courses feature quizzes and post-tests to gauge comprehension and competency, contributing to the development of clinical expertise. Infection Prevention provides education on infection control, standard precautions, high touch points, cleaning practices, and more. Facility Precautions covers facility instituted precautions for many areas including contact, airborne, transmission and more. Hospital Acquired Infections covers infections such as central-line blood stream, catheter-associated urinary tract, pneumonia and more. Medication Safety provides education on the pharmacy and nursing team relationships, medication administration, drug diversion, pharmaceutical waste and blood transfusions. Anticoagulation covers education on blood thinners, considered a high risk medication. Blood Transfusion covers transfusion education such as equipment, patient monitoring, safety precautions, how to respond to an adverse reaction and more. “This is training that can happen on a tablet, right next to a patient care environment, and in the presence of a preceptor. We can document that people are achieving competency in the clinical space at the bedside.” - Dr. John Vozenilek, MD, FACEP, Chief Medical Officer, Jump Trading Simulation & Education Center. For more information, visit http://www.healthscholars.com. Health Scholars™ is a program developed by the expert nurses at OSF to help standardize the educational process across the spectrum from novice to expert using mobile technology. The firsthand experience of the OSF nursing team across a wide field of specialties paired with the advanced technological capabilities CSE Software™ Inc. and SIMnext™ have created a new standard for nurse education. Health Scholars™ is developed by CSE Software™ Inc. and SIMnext™. As used herein, "CSE" or “CSE Software™” means CSE Software™ Inc., an Illinois corporation.